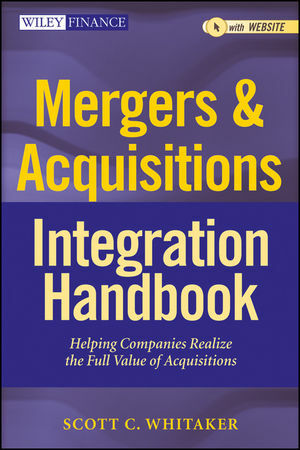 Mergers & Acquisitions Integration Handbook is a comprehensive resource to help companies create a scalable post merger or acquisition integration process and framework that accelerates operating and business benefit goal realization. Includes tools, templates, forms, examples and checklists to provide a no nonsense “handbook” style approach to managing an effective integration. Helps integration managers quickly get up to speed on various integration challenges, including guidance on developing detailed operational and functional integration plans to support flawless execution. Reveals how to avoid integration failure by establishing an in-house integration management office to handle integration projects. Includes a sample integration playbook that can be used to create a core competency within companies to support ongoing integration activity. Botched integration is the number one reason mergers fail. Mergers & Acquisitions Integration Handbook shows you how to develop, execute and implement merger integrations and business strategies to realize your organization's mergers and acquisitions goals. SCOTT C. WHITAKER, CMC, is President and CEO of Whitaker & Company, an Atlanta-based consulting and project management firm specializing in helping companies to develop, execute, and implement merger integrations and business strategies designed to achieve growth. Since 2005, Whitaker & Company has been involved in merger integration and strategy and operations projects totaling more than $25 billion for both domestic and international companies.